This video discusses the 2 distinct ways that Whole Life insurance policy can provide income in retirement. See the effect of bleeding down a policy with withdrawals then loans, as well as how the policy behaves when taking only dividends in cash. 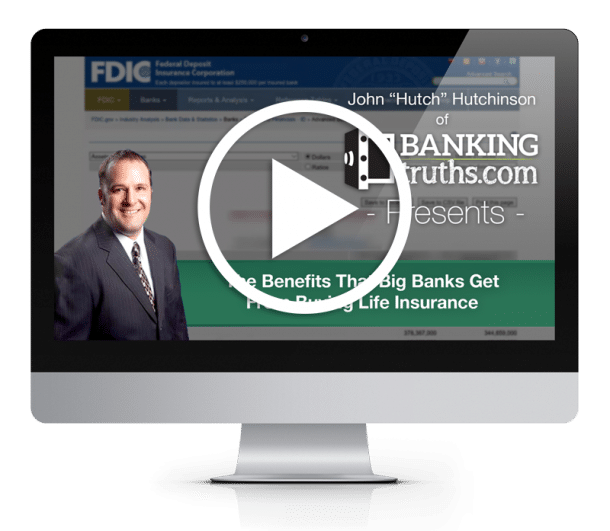 Hi everybody, this is Hutch with BankingTruths.com and today we’re going to talk about two different ways to take income from a whole life policy. So we’re going to first look at the traditional paradigm of funding an asset class for a number of years. In this case, we’re just using seven years putting $20,000 a year times seven years. You could and you should pay longer. But we like to show people that if you had to stop after 7 really you could probably stop after 5 but if you had to stop after 7 this is still pretty good. Now I know over here it says you’re still paying and the total premium comp 57 45. And technically you are kind of paying you’re just not paying from out of pocket. What’s happening is you’re supplementing this from your dividends and policy growth. So all it’s doing is it’s stunting policy growth. And the reason that is is we have the death benefit continuing to grow until age 65. And you don’t have to do this, we’re just showing people excuse me until age 64, that if you needed the coverage during the working years you just let the death benefit continue to grow in which case you need to pay the absolute minimum base premium, even if you do so out of your dividends. Now notice here between age 64 and 65, the death benefit drops here tremendously and that’s because we’re electing what’s called a reduced paid-up option, RPU. And actually, if you go to my site slash RPU – BankingTruths.com/RPU you can read all about how that works. But essentially what’s happening is no more mortality charges are coming out there’s nothing coming out of this thing it’s all going to grow and it’s supporting what death benefit is left. Now if we didn’t take income the death benefit would start to grow from here. But since we are taking this $18,000 of steady income per year as you can see here, what’s happening is a couple of things. We’re not borrowing yet at least. So you can see here in the income column it’s just straight 18’s. When you look at total loan balance what’s happening is we’re withdrawing our basis. So remember we put in seven twenties. So what we’re doing is we’re going to take out 140,000 dollars totally as a withdraw totally tax-free because that’s allowed in life insurance. And then when you withdraw more than your basis in life insurance. Well now you have to pay tax on your growth, right? And life insurance is unique in that you get to pull out your basis what you put in first totally tax-free. Free need to life insurance. However, if we want this 18,000 to continue to be tax-free, we can borrow against. Not from we’re not borrowing our own money. Money’s not leaving our contract. Right? So we’re actually borrowing against our total cash value which you can see is one hundred eighty-nine thousand right before we start borrowing. Now see it says total net cash value? That’s because our full 189 is continuing to grow and earn dividends and the guaranteed growth but they’re only giving us our net cash value because we have a lien against it. So the insurance company is giving us a separate loan against it. And so our cash flow is going down as is our death benefit. And if we just go to the next page what we can see here is we bleed it all the way down to age 65 where we have very little cash value. Excuse me we have very little net cash flow. You can see the total loan balances 303. Really we have like 3… 300000 and 14 the 303 plus 11 of cash value earning interest and dividends in here. But what’s happening is the loan is starting to cannibalize it. What’s nice is certain insurance companies like this one have a little feature as you can see with the footnote here called overloan protection where they’re not going to let this thing cannibalize itself because if you can’t afford to pay any loan maintenance which at 85 you’re probably not going to be able to hold down a steady job. You may not want to pay any loan interest. What’s going to happen with other policies is this thing could blow up on you unless you manage it. But this particular company says OK we’re just going to put eighty-one thousand dollars in a vault for your heirs. You actually still have some cash value that grows we’re just not going to let you take any more of it and we’re just calling it a day here. So essentially you’ve taken a lot of income some as a withdraw some as a loan if you think about it you took almost 20 years of 18000, you took 19 years of 18000. And this little 13000 for putting twenty thousand dollars in. And yet life insurance the whole time and there’s 81000 left behind. So that’s the first way. And the traditional paradigm way to take income from a life insurance policy. So same exact policy right. The 20000 going in seven times, the death benefit grows right up until we elect the reduced paid-up option. Now what you can see here is the death benefit stays relatively flat. It increases a little bit and the reason being is because in this scenario we’re taking our income as dividends in cash. Right? So we’re just taking last year’s dividend. Last year’s dividend they’re dispersing it to us in cash. What’s nice about that is when you take dividends in cash. Remember we elected this reduced paid-up option? So this death benefit is contractually paid up. It can not go down, right? We’re locked into this death benefit. Also, we’re not taking any of the guaranteed interest, any of the guaranteed cash flow growth. All we’re stripping out is non guaranteed dividends. And this is showing it at today’s low dividend interest rate. If dividends are higher in the future this number could be higher if they’re lower. It could be lower. But this guaranteed cash value guaranteed to grow on the schedule. Now we don’t know if it will arrive at this number because all this prior data is based on today’s dividend interest rate numbers. It could be higher if things get higher. But what I want you to see is these two columns whoops lost my little magic pen here. These two columns these two columns. This is guaranteed growth and this is a guaranteed death benefit. So if there’s a situation where somebody wants to make sure they have this emergency reserve fund, they want to make sure they have a certain amount of death benefit for heirs and still take income on without messing with these guaranteed elements over here. Right? Obviously, this income will fluctuate with the current dividend rates. But the other two will not and if we just scroll down here you can see even with the dividend interest rate staying the same. Because we’re illustrating it at today’s dividend interest rate because your cash value and your death benefit are both increasing. This entitles you to a bigger cut of the dividend pool in the future so you get this nice natural growing income stream from dividends and cash, which is very very nice to have. So we like to see this when people just want to maintain death benefit and supplement their income like somebody who’s supplementing a defined benefit pension or somebody who has other sources of income and wants to bleed down their more tax non-friendly things like retirement plans or taxable stocks. If they want to bleed those down and keep this safe money safe. This is a great way to do it. So take a look at what’s possible with your own policy by scheduling a meeting with us here and we hope to talk to you soon.